I wasn't going to go to my Senior Prom. People started arranging their dates months in advance and like most of my time in high school, I was single. Since there was no way that I was going alone, I just wasn't going to go. I was disappointed, but not heartbroken. The truth is that I had this huge crush on a guy who had graduated a few years before me and he saw me like a kid sister. Anyway, this friend from church told me that I shouldn't miss it, I would regret it for the rest of my life, etc etc. He said he would take me and that way I could go. Well, what girl wouldn't jump at the chance to go, so I said yes. Fast forward a couple of months...suddenly, I have a boyfriend. Oops! He'd graduated a year ahead of me from my high school. I didn't know what to do! Luckily, he was a great guy and said that Rob (guy 1) had already rented his tux, etc so to go with him and we'd hang out after prom. Fast forward to the day of Prom. My paternal grandfather had died and they decided to hold his funeral on Prom Saturday. Now, I wasn't (& still aren't close) to that side of the family but I thought that I should go..maybe heal some old wounds. Before the funeral, my friend Kim (*waves in case she reads this) and I met up at another friend from church's house to have our makeup done. I can't recall her name, but I know that she sold Mary Kay, I think it was. She showed us how to get all glammed up..the difference between day makeup and night makeup. She even gave us some samples to tuck into our purses for that night. Then, I, wearing my prom makeup, went to the funeral. Let's not get into how much I regret doing that and the lies that I heard told there. Then, I raced home to have my mom and grandmother do my hair and to get dressed. I think I had 45 minutes to get ready before my dates showed up. Yep, I said dates! Somehow it got decided that we (Rob, Russ (boyfriend) and myself) would meet at my house and all 3 of us would go out for dinner. Russ bought a new suit. Rob wore his rented tux. I had corsages for both of them. Rob was supposed to bring me a corsage made out of roses, but as you can pry see in the picture, he messed that up. Anyway, we went off to dinner and it was yummy. It's the only time I've eaten at the Heritage House. Afterwards, I dropped Russ off at my place to pick up his car and Rob and I went on to Prom. We had our pictures taken and then I didn't see him for most of the rest of the night. Turns out he'd only used me to get into our Prom. I danced one dance that night...with my next door neighbor because he felt so bad for me. 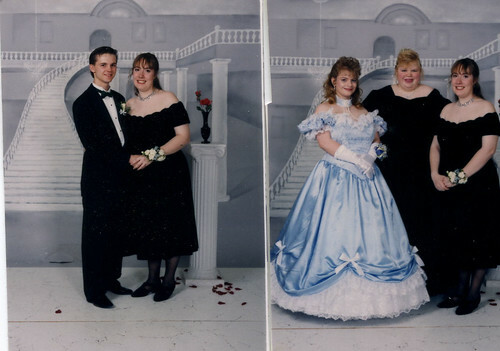 Then, we went off to post-prom which wasn't much different. I had a good time with the girls, but Rob was nowhere to be seen. Jerk. We left there early because I was supposed to pick up Russ and we were going to watch movies. Except, he didn't come to the door when we showed up. It was the middle of the night and his mother hated me so I gave up after a few minutes. Man, I remember being pretty unhappy. In the end, I drove Rob the 45 minutes home and drove back totally on autopilot. I didn't remember anything between leaving his driveway and pulling into the edge of town where I lived. Oh, did I mention..the necklace in the pictures? It belonged to Rob who insisted that I wear it. I still don't know why. Wow! What a night!... I'm glad you shared though. Yes, I'll have to tell you how it works out with the donate or I'll do a post. Stay tuned: I'll also be doing a post soon about advertising job openings. Time for Me Thursday -- Review & Giveaway! Tackle It Tuesday - - On Thursday!